Central Taxis were delighted to attend The Society of the Golden Keys of Great Britain and the Commonwealth AGM at Blythswood Square Hotel last night for the presentation of a cheque for £8000 to Central’s Charity Partner the Edinburgh Children’s Hospital Charity. A massive thanks again to everyone who attended the St Andrews Ball in November and helped raise money for such a great cause. The ECHC are using the funds to buy an Oor Wullie statue as part of the upcoming national Oor Wullie’s BIG Bucket Trail. This ‘Wullie’ will be designed in the inimitable style of Edinburgh fundraising legend Tom Gilzean, tartan breeks and all, and subsequently be auctioned off to raise even more money. It will also provide a lasting Thank You to Tom for his remarkable fundraising over the years for good causes, including the ECHC and Edinburgh’s annual Kiddies Taxi Outing. 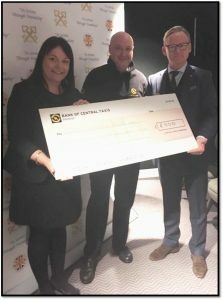 Roslyn Neely, Chief Executive of the ECHC received the cheque from Central Taxis Chairman Tony Kenmuir and Alan Grimes, Chairman of Les Clefs d’Or Scotland. For more information on the Oor Wullie Big Bucket Trail and how to get involved visit www.oorwullie.com.